Here is the Learning Path for a key target audience of 1100 in 5 Business Units. It is more menu than path. It also had a planning guide – and a video to explain the whole curriculum architecture. It was first constructed in 1986 and refreshed in 1989 (the Path below is the 1989 version – that had few changes from the 1986 version). 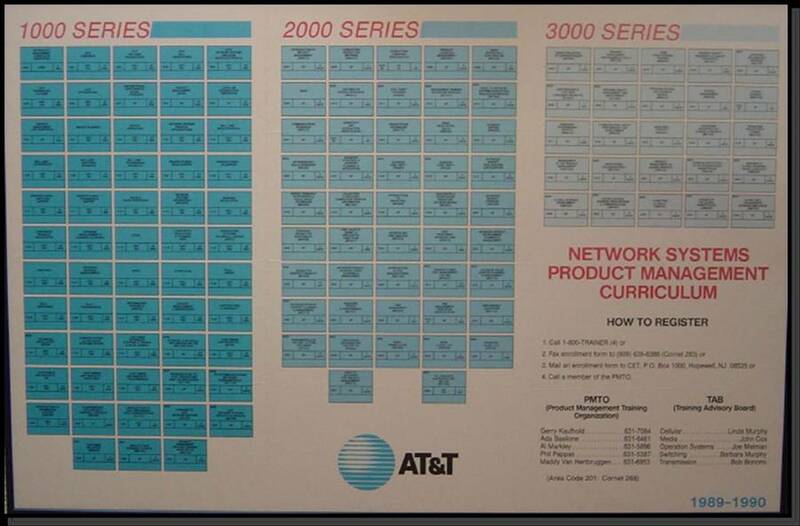 Here is an 11 minute AT&T-Network Systems video – Module #1 in the Product Management Curriculum. See the small box in the upper left corner of the Curriculum poster. Here is me on video for 9+ minutes in 1987 explaining the front end of the Product Management Curriculum Path – in the last Module of the 1000 Series – in NS1251 – an 8-day ILT on Product Management Process Training: Basics Skills. 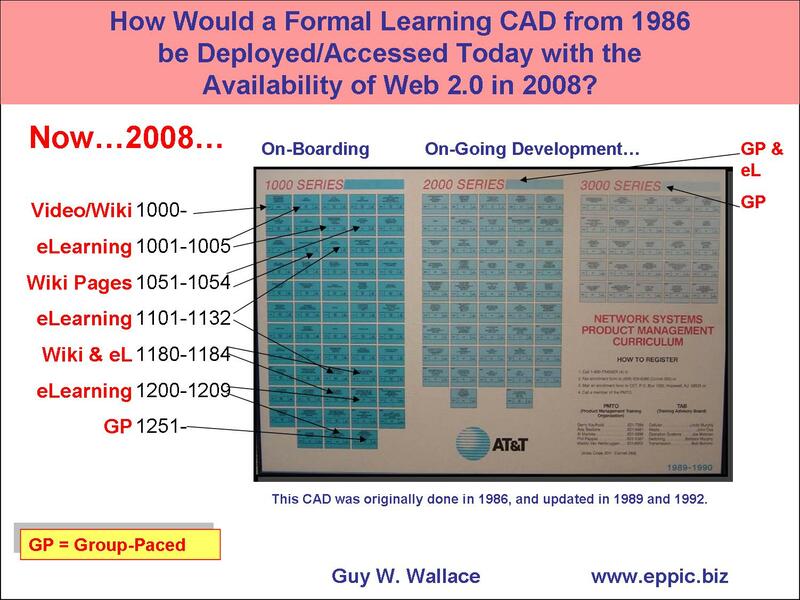 – from 1997 about a combined CAD-MCD (branded as: the MC/MI Processes – in General Motors) effort – that won a GM Chairman’s Quality Award – for an effort that produced an 18-month program of 1-week training and 1-week work assignments – which I designed for others to build – and to build around the existing content that we had uncovered that could be used AI (As Is) or AM (After Modification). The work assignments related directly to the advanced organizers, orientations, and the skills training of the week before. The 18 months of the program had been set by the client before we started. And we easily filled it with content that focused first on the job “performance requirements” of our Performance Model – and the enabling Knowledge/Skills as documented by the K/S Matrices – all approved by the clients after a review – and remarks such as Holy Cow! That’s a lot of enablers! Which is a typical reaction to the number of discreet enablers. They – enabler items – typically range in number per project – from 400 to 900 for a single, critical job in critical Enterprise processes. You won’t uncover all of those via your interviews and observations. Think of what then gets missed in the Path for that audience – without that upfront rigor to first understand the job performance requirements!!! 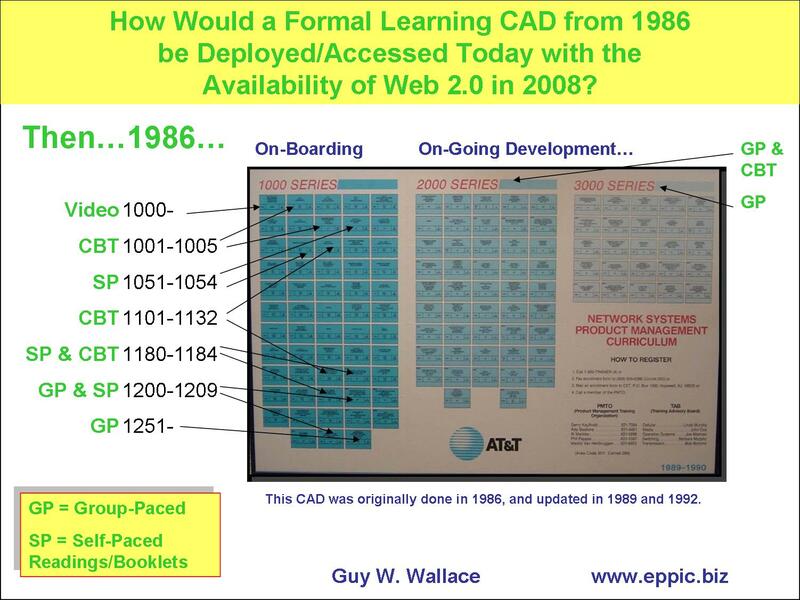 Here is a 2 hour video of me at Eli Lilly in 1995 explaining the CAD methodology using my presentation materials from the ISPI conference earlier that year. Here is how that Curriculum might be deployed today – and then also supported perhaps with a Product Management Network/Community on some Social Network/Media – and using some Content Management System platform for sharing examples and templates and tools. One of the key things about this multi-year effort – was that much of the content produced was needed by other critical target audiences associated with the NPD – New Product Development processes – as well as for those involved in the OnGoing Life Cycle Management of those Products. The PM audience was PUSH. All others (by definition based on their worthiness for the full CAD treatment – or not) were PULL audiences – and there was critical content available for their jobs as it related to NPD and Life Cycle Management – but not content for their full jobs. Unless they were on the list for future CAD treatment.